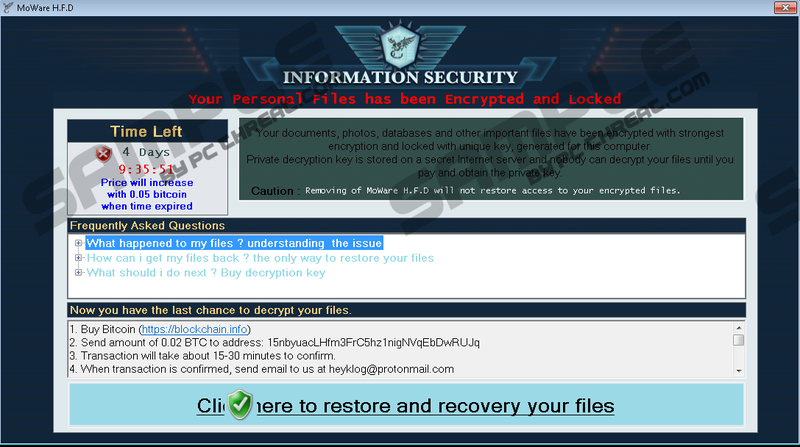 MoWare H.F.D Ransomware could be your worst nightmare right now as this malware infection is capable of encrypting hundreds of file extensions. However, our research and tests show that this ransomware program does not work for the time being, which means that it does not actually encrypt anything. It is possible that the Command and Control (C&C) server is down temporarily. In any case, at the time of our research this malicious program did not show any dangerous activity. So if you are that lucky, you may avoid losing your precious files this time unless the server goes back online again. This malware is based on the infamous Hidden Tear open-sourced ransomware that has provided base for a growing number of infections, including CryForMe Ransomware, $ucyLocker Ransomware, and Executioner Ransomware to mention a few from the recent past. This ransomware emerged at the end of May. Either it works or not, we recommend that you remove MoWare H.F.D Ransomware right away if you want to save your computer. Please continue reading our article to find out more about this potentially dangerous threat. This malware infection is not different from any mainstream ransomware program as for its distribution methods. The main channel to spread this threat is via spamming campaigns. A lot of people are still easily fooled by spam, no wonder why criminals like to use this method. Obviously, the spam mails of today are more sophisticated than they used to be. Back in the "old days" it was very easy to spot one as they had typical subjects and tell-tale e-mail addresses. This has all changed and now you may not even be able to decide yourself whether you are dealing with a legitimate or a malicious mail. Most likely you check your spam folder every day as there could be legitimate and important e-mails ending up there, too. Since this spam may seemingly regard an urgent matter, it is quite possible that you would not ignore it. You may think to yourself, "What could happen if I just quickly see what is in this one?" but the problem is that the body of this mail will not give you satisfaction. It is created that way; it is supposed to make you want to click on the link that may be part of the body and may link to an online stored file, or to open the attached file. In both cases, the file in question is obviously a malicious executable that will initiate this attack. You are only very lucky if you can delete MoWare H.F.D Ransomware this time without any severe consequences. Normally, removing the ransomware would mean losing all the encrypted files. So remember how important it is to prevent such a dangerous infection from entering your computer. Another way for you to end up with this ransomware on your system is to download free software from questionable sources. It is possible that you see a pop-up ad offering you a software download or update, but you may search for free software on the web and land on shady torrent or freeware pages. Downloading anything through such sources can end badly and you may infect your system with a bunch of malware threats, including this one. It is important that you make sure there are no potential or malicious threats on your system at all times. Therefore, we suggest that after your delete MoWare H.F.D Ransomware, you run a malware scanner that you can trust and identify all other possible threat sources as well. This malware infection is supposed to encrypt your photos, videos, databases, and archives with a serious algorithm, but we have experienced that the C&C server may be down and thus this encryption is not performed. The affected files should get a " .H_F_D_locked" extension, so you can easily check whether any of your files are encrypted or not. Do not panic even if the ransom note that comes up in the application window on your screen claims differently. Obviously, this note says that your files have been encrypted. You are given 4 days to transfer 0.02 BTC, which is around 45 US dollars. If you fail to do so, you have to pay 0.05BTC (112 USD) more until the next deadline expires. If you have made the transaction, you have to send an e-mail to heyklog@protonmail.com to get the promised decryption key. However, we must warn you that you should not trust such cyber criminals at all. They usually only care about you and your files until you transfer the money. Also, why would you support cybercrime at all? Since this infection does not seem to destroy your files for the time being, we highly recommend that you remove MoWare H.F.D Ransomware immediately. Unfortunately, this ransomware disables some of your main processes, such as the Command Window, the Registry Editor, and the Task Manager as well. Therefore, you cannot actually do anything unless you enable these. Then, you can delete the related registry entry and files as well. If you are ready to act manually, you can use our instructions below. It is possible that you will consider these steps exceeding your IT skills and would like to have an easier way out. Well, in that case we advise you to download and install a reliable anti-malware program (e.g., SpyHunter) that can automatically defend your PC against all known malicious threats. Press Win+R and type in gpedit.msc to open the Local Group Policy Editor. Click OK.
Navigate to User Configuration -> Administrative Templates -> System. Open the "Prevent access to the command prompt" option by double-clicking on it. Select Disable and click OK.
Now, open the "Prevent Access to registry editing tools" option. Choose Disable and press OK.
Now, open the "Ctrl+Alt+Del Options" option and double-click on "Remove Task Manager". Set its value to Disable and click OK. Locate and remove "HKCU\Software\Microsoft\Windows\CurrentVersion\Run\MoWare H.F.D" value name. Locate and bin the malicious file you have recently downloaded. Quick & tested solution for MoWare H.F.D Ransomware removal.